One of the neat things Microsoft incorporated into Windows with the release of Internet Explorer 4 (which was provided for Windows 95 and Windows NT 4.0 with Service Pack 3) was the CryptoAPI, which provided not only services for secure hashing and stream ciphers, but also implemented Microsoft's Authenticode (r) code-signing verification. Authenticode is the technology that allows a Certification Authority (CA) such as Verisign to issue certificates to its clients in order to establish that software has been signed and is still authentic (that is, it has not been modified by any third parties). This is beneficial for obvious reasons, of course - when you're installing the Flash plugin, for instance, having an Authenticode signature verifies to you that the code is actually from Adobe, and that it hasn't been modified for some malicious purpose by a third party (such as a hacker). 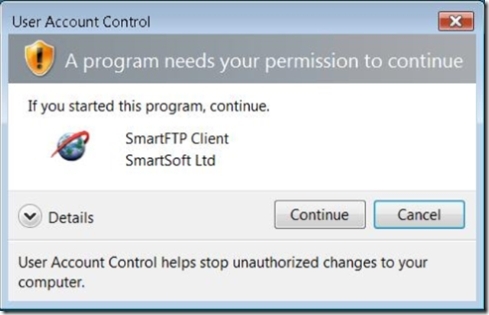 Windows Vista has incorporated this further by presenting User Account Control (UAC) dialogs based on the code-signing policy defined by the system. When prompting for elevation, Windows Vista chooses one of four dialogs based on the security policy and code signature of the target executable. As a software developer, verifying code integrity can be important; as a .NET developer, you of course have the Strong Name tool (sn.exe) to generate a private/public key pair with which to grant trust to assemblies (avoiding a trojan horse assembly in the process). However, there may be times where we want to validate the digital signatures of non-CLR assemblies, macros, or some other entity that was digitally signed. This will get you started by verifying the digital signature of a file; however, it can be used for other entities as described in the documentation. The AllocMethod enumeration simply specifies the HGlobal and CoTaskMem members, which indicates how Marshal originally allocated the memory. With this class, I can now drop the memory blocks into using statements to have them automatically cleaned up, dodging a memory leak. Note that this class allocates unmanaged memory for the pgKnownSubject member - it is actually a pointer to a GUID structure, not the GUID structure itself. Since we're not making a P/Invoke call, but a marshalable structure, we can't define a "ref" field. I could have alternatively used a Guid* pointer type in place of that IntPtr, but I decided to stick with verifiable code. (Note that this is also true in the upcoming code, where a WINTRUST_FILE_INFO pointer is one of the fields. The WINTRUST_DATA structure defines a union where I defined the pInfoStruct field. It's possible to create something similar to a union in C#, by setting StructLayout as Explicit, and by putting each of the fields in the union at the same field offset. The drawback is that each field needs an explicit offset, which makes the structure not cross-platform (as 32-bit and 64-bit platforms will require diferrent field offsets). I decided again to go the path of the IntPtr and do the custom marshaling myself. You should note I use several enumerations - these are all defined on the API specification for WINTRUST_DATA. The hardest part of utilizing this code is dealing with the myriad of return values (which I will not go over here). Essentially, if the API returns 0, then the file is signed; if not, you can use Marshal.GetLastError() to determine the results. Kudos go out to Microsoft for the example C program on which this article is based! I think he forgot to include some enum definitions. Adding the following at the top made it work. However, even with all of this, I'm running into memory exceptions at the using (UnmanagedPointer...) calls. It never fails if the file sig is valid. But it always fails after the second call to an unsigned (or invalid signed) file. In line 8 of the WINTRUST_DATA structure code, changing the third parameter of StructureToPtr to false cleared up the exception. This could lead to a memory leak so I have manually added a call to fileInfo.Dispose() after line 18 of the WinVerifyTrust method. Could you please make a sample code for downloading? I am writing managed wrapper for one of native library using p/invoke. So we have lots of complex data structures in native library. I am facing similar type of problem as you have solved in this blog.You have shown how to marshal WINTRUST_DATA's union,from managed code to un-managed code vice versa using IntPtr. But there is subtle difference in my problem. But WINTRUST_DATA has union which in turn can contain pointer to struct.But in my case there is no pointer to struct in union.There is user defined type itself. When I i try to user your IntPtr approach,My application crashes while returning from native code (where it passed as ref parameter). To summerize My problem is how to marshal structure containg union though p/invoke. Please could you suggest me ,How can I deal with this problem. Any idea to get more informations on both ways ? From my experience, dealing with the Winverify Trust API from .Net's perspective is always tricky. This article certainly lends a helping hand.